I loved this book. It’s a great collection and really deserves the positive critical reviews it is getting. I’m very happy for Dina. I’ve managed to have my name end up on the colophon page of a few books but never the acknowledgements. None that I’m aware of anyway. So the acknowledgements shout out to my old little Downtown Eastside gallery where Dina happened to be in the last show I was involved with there gave me all the feels. 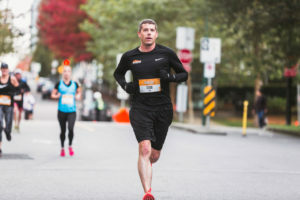 I Turkey Trotted, and it was a lot of fun and I set a new best for 10K shaving over 2:30 off my PB at the 2016 Eastside 10K, and I scored my first top 10 finish with a seventh in my age category. I was less excited when I saw the posted results at the finish, with me coming in seventh out of nine. But by the time all the results were in it was 7/153. My knee is still not very happy with me and my physiotherapist said no running if I want to be better by the Fall Classic and I do but I went out on Friday the 13th and did the Ghost Race because Don’t Tell Me What to Do (thanks Dina) even though I dislike Lululemon (but have somehow managed to justify Kit & Ace). But since then I’ve run none and I’m going a bit crazy even though I’ve put about 100 km on Mobi Bikes it’s just not the same. I’m still over 200 km ahead of pace to reach my goal of 2,600 km in 2017 but for my head’s sake I really need to go for a run.